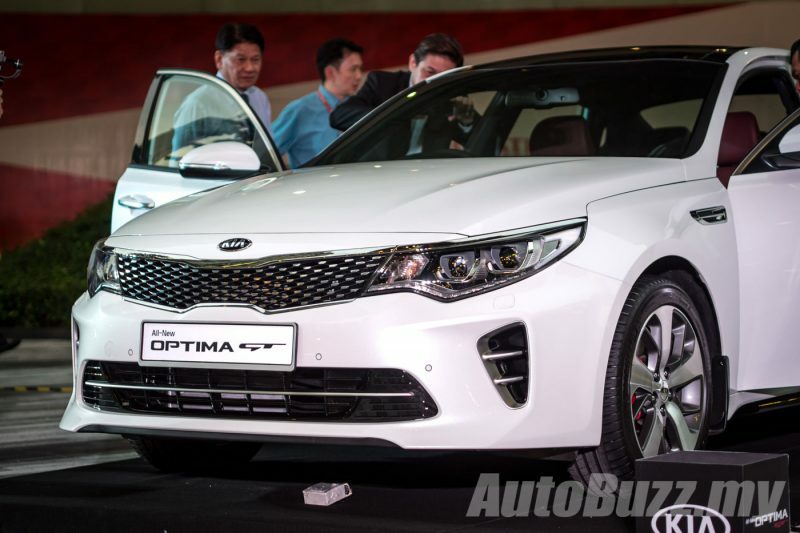 HomeCar LaunchesKia Optima GT storms into M’sia, 242 hp & 350 Nm, CKD, priced at RM180k! 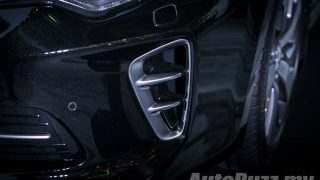 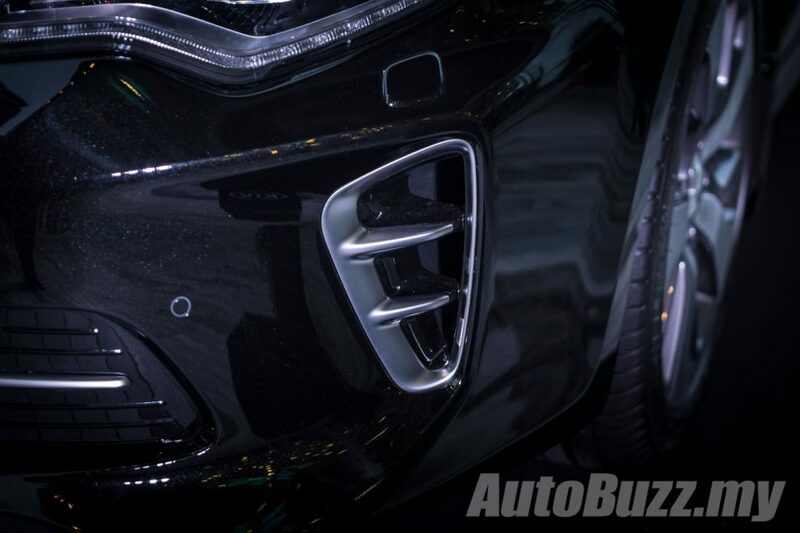 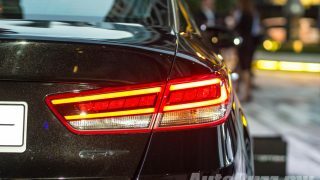 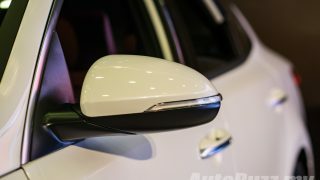 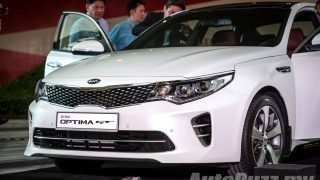 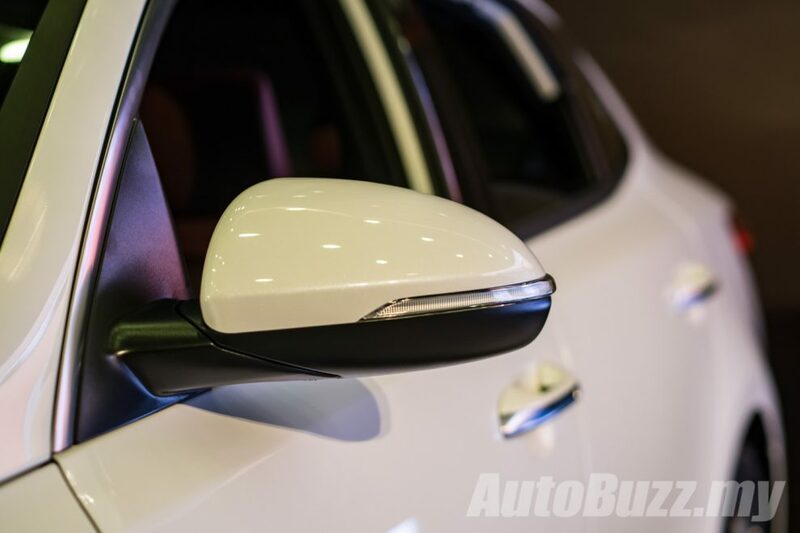 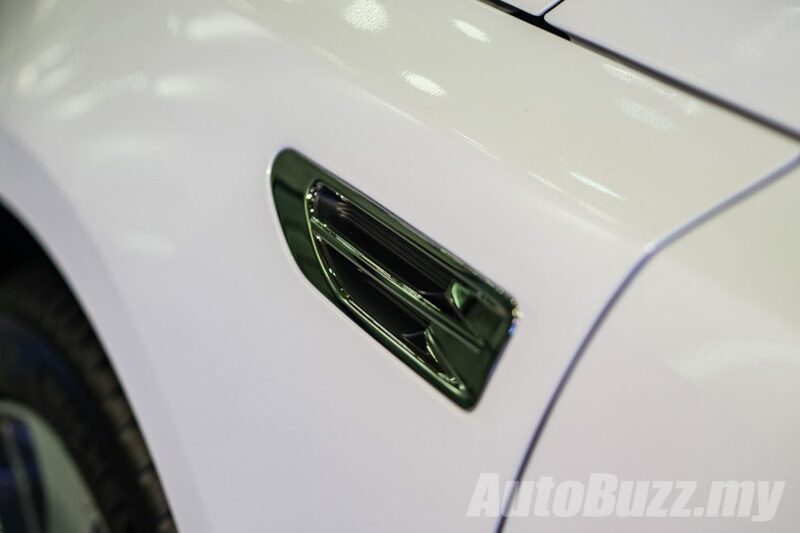 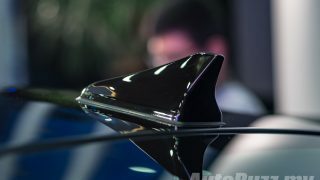 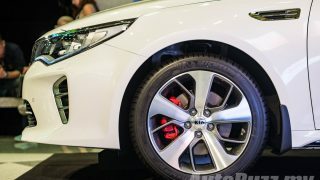 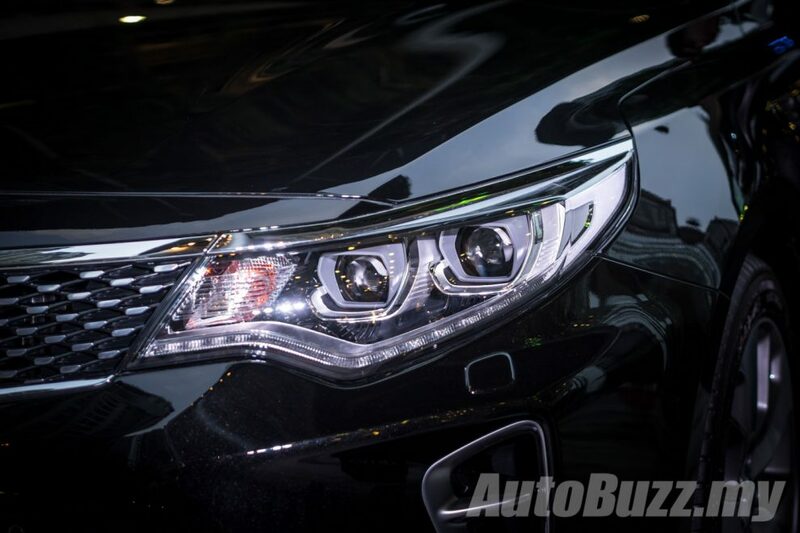 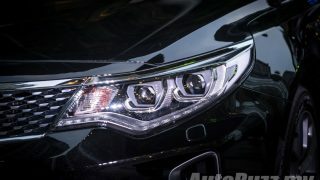 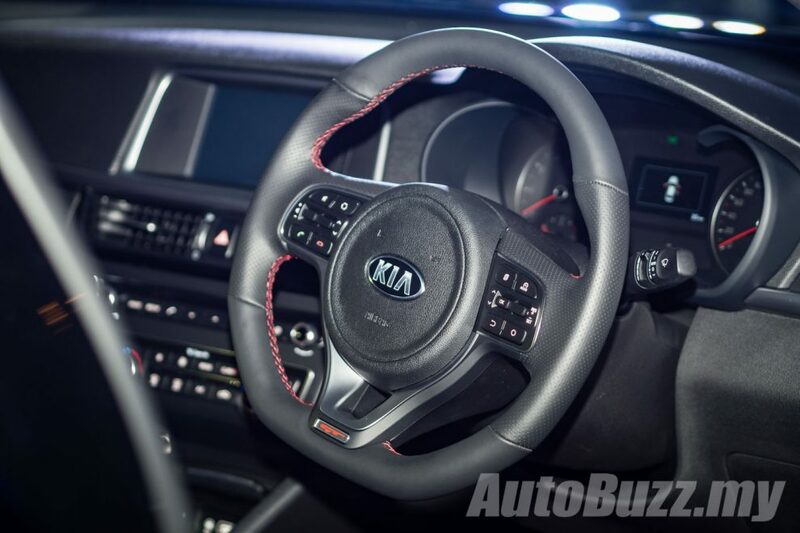 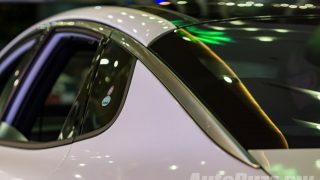 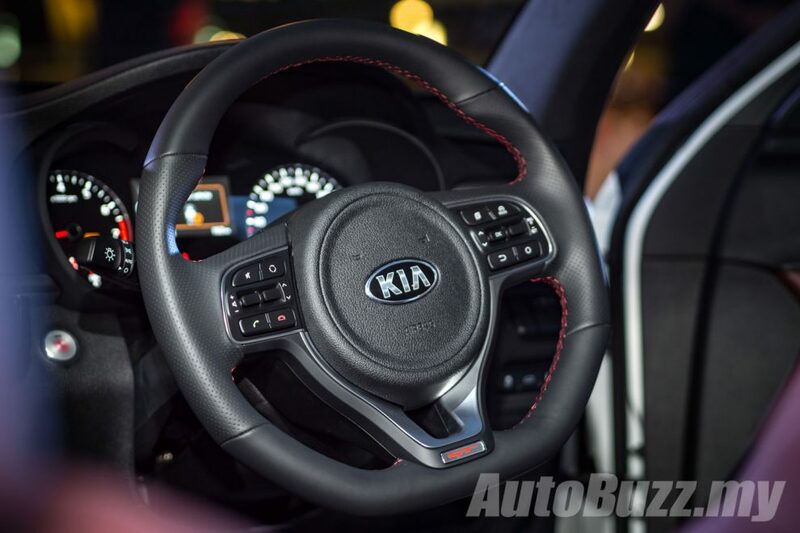 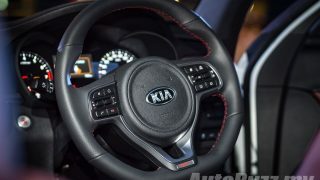 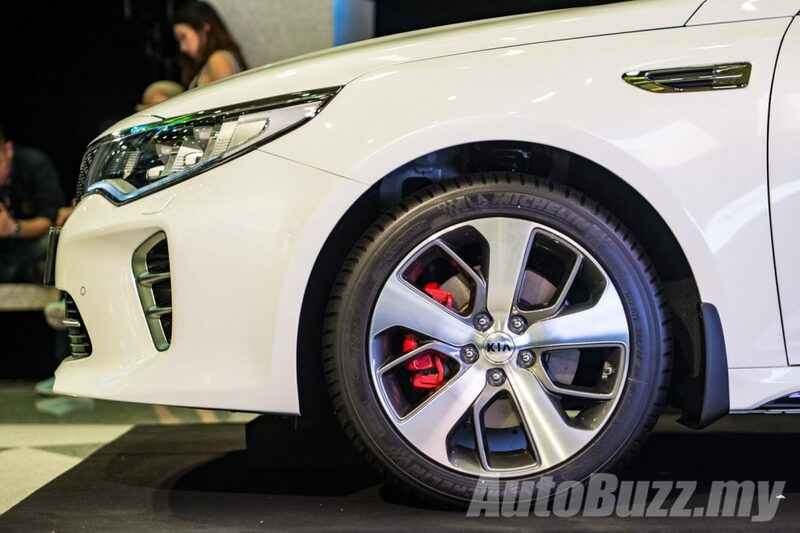 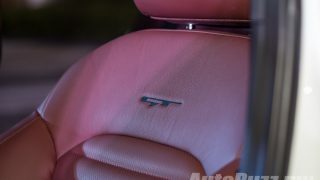 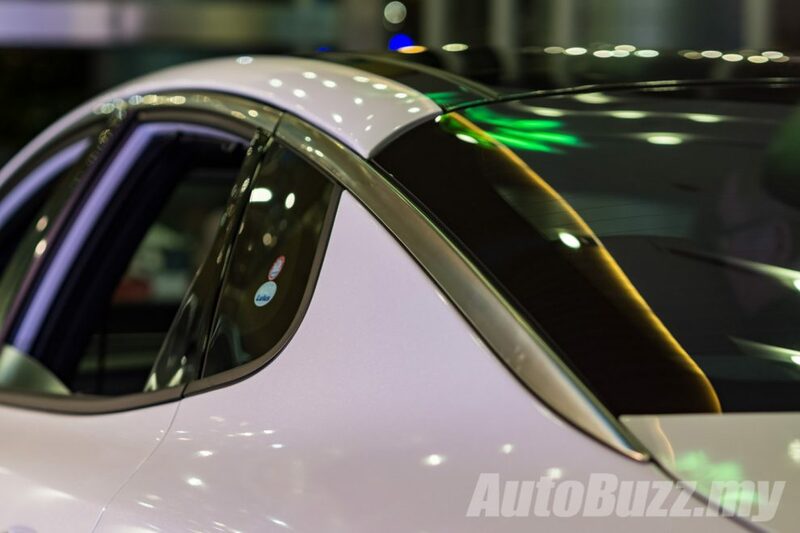 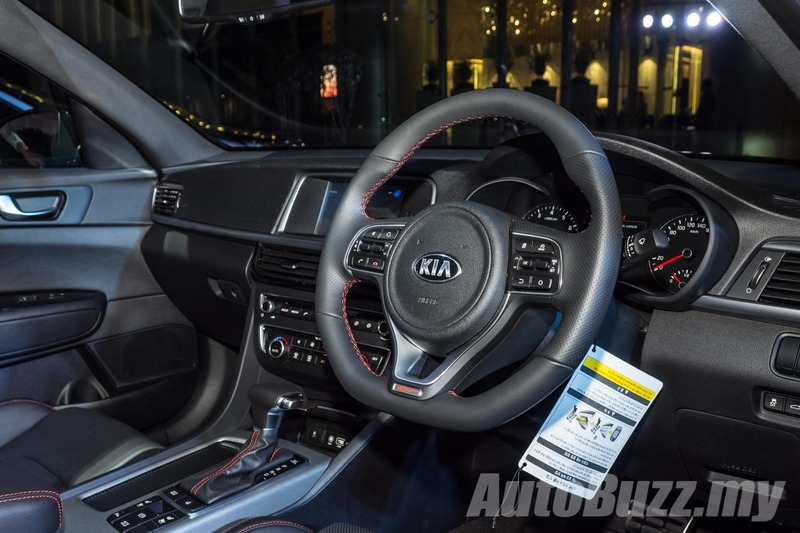 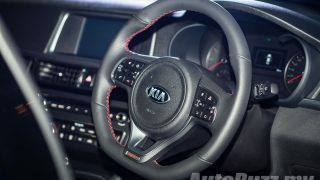 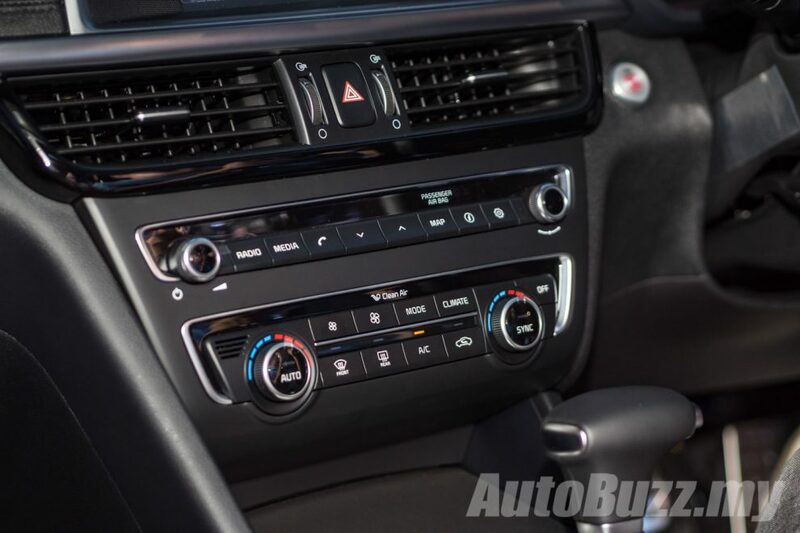 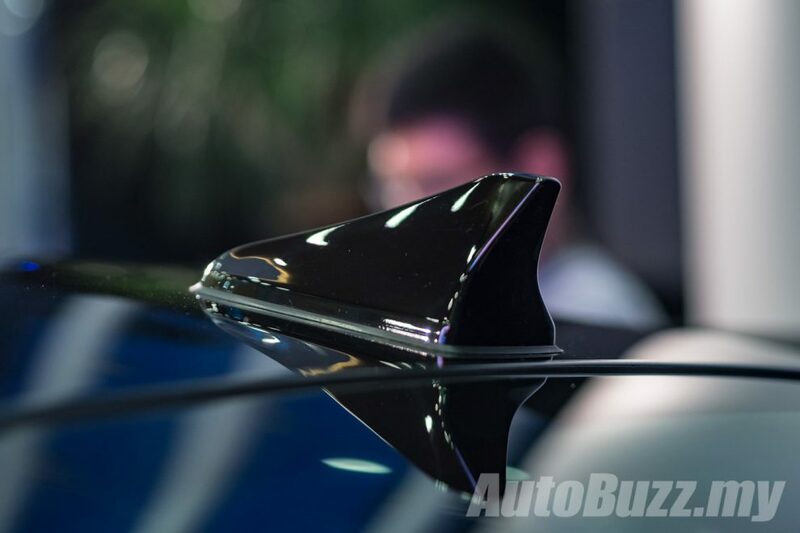 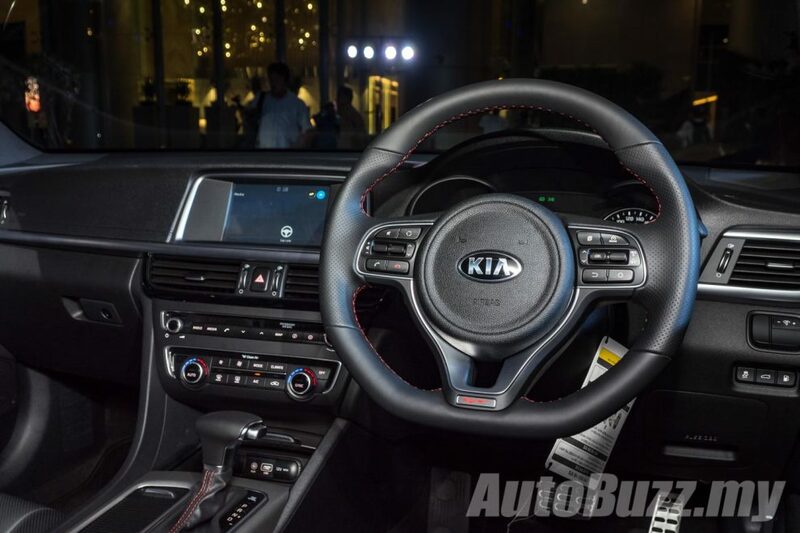 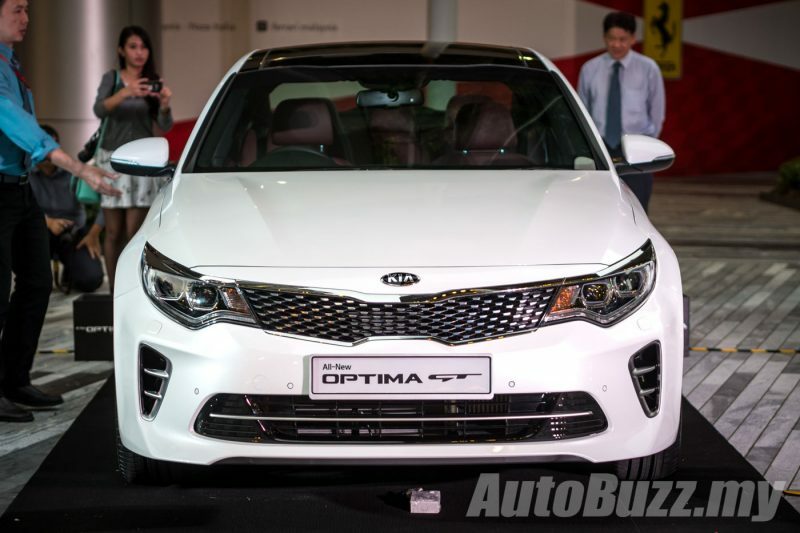 Naza Kia Malaysia (NKM) promised that the all-new Kia Optima will come in its hottest and most dynamic trim, and true enough they delivered. 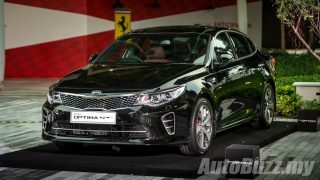 Introducing the first turbocharged D-Segment contender from Korea, the fourth-generation Kia Optima GT. 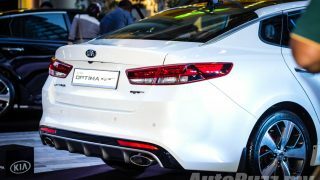 Compared to the outgoing Optima, the fourth-gen is 10 mm longer (4,855 mm), 30 mm wider (1,860 mm) and 10 mm taller (1,465 mm). 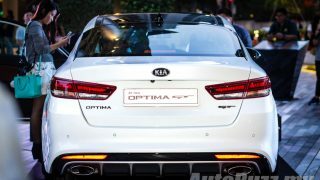 It also boasts a longer wheelbase of 2,805 mm. 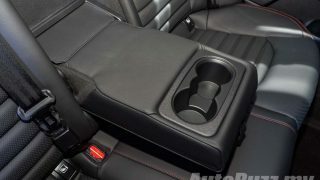 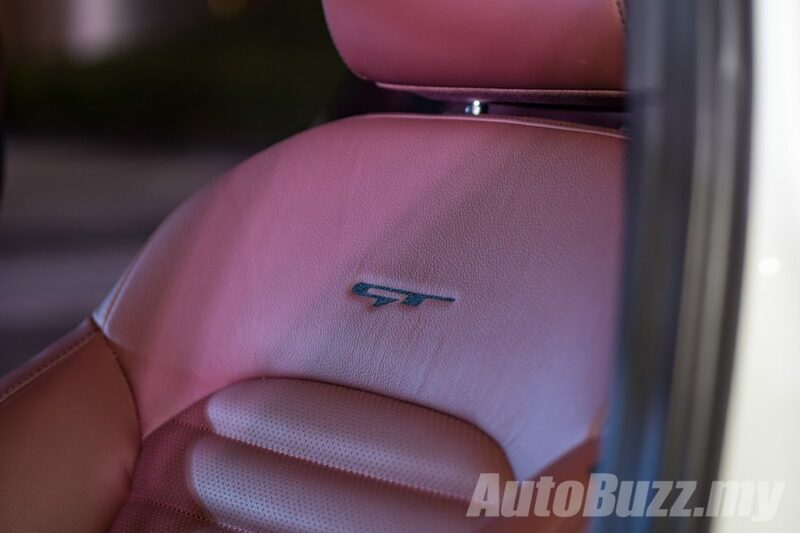 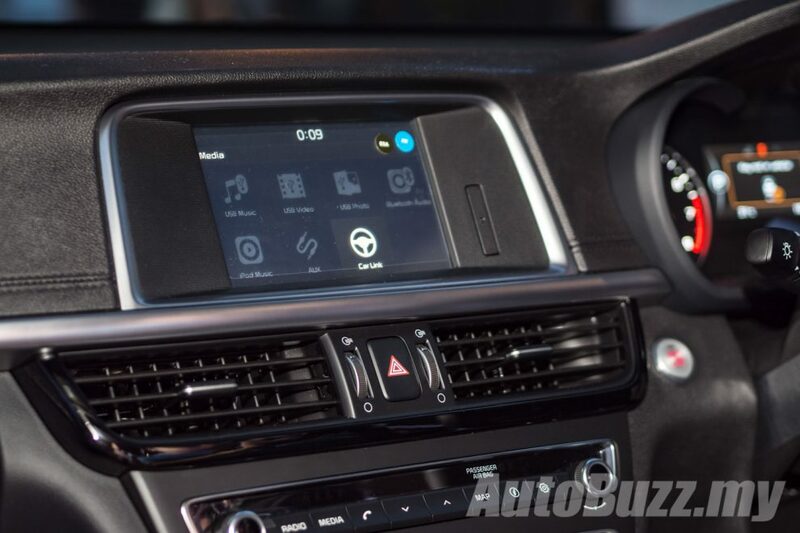 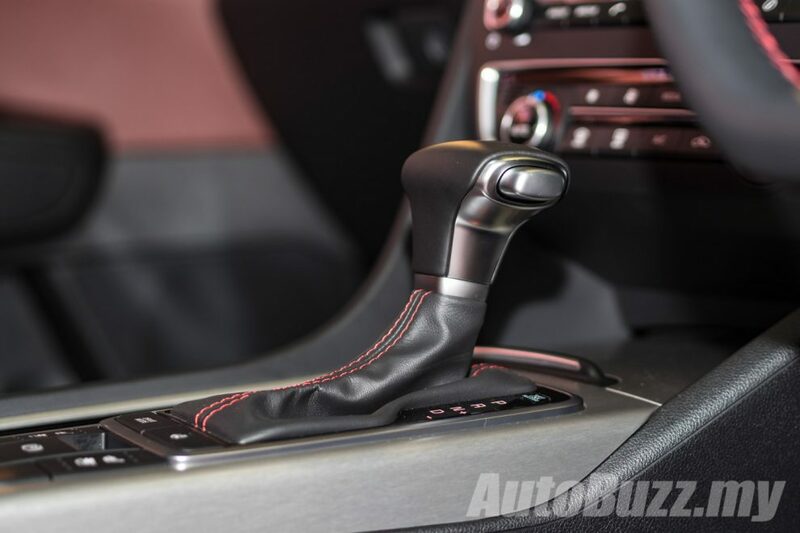 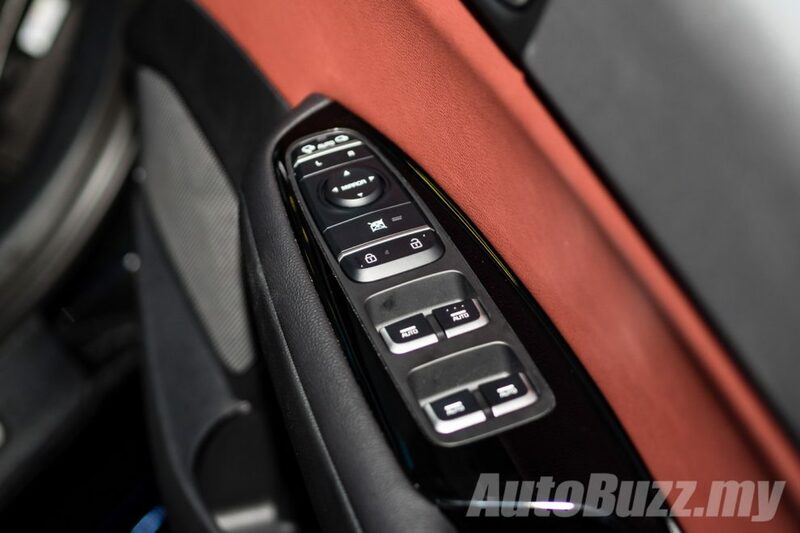 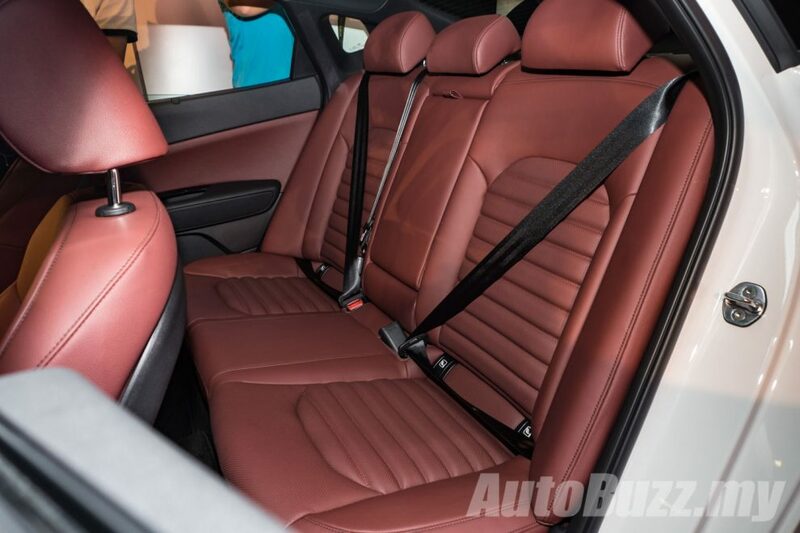 These altogether translate to improved interior space for all occupants. 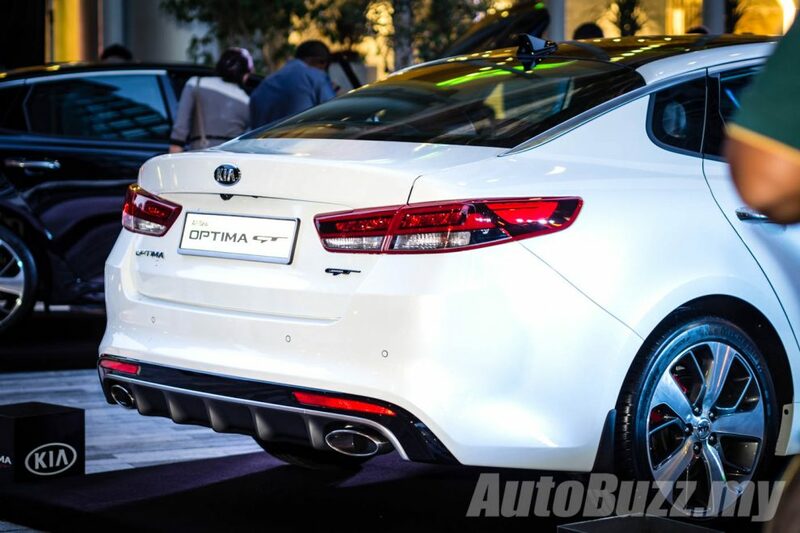 Up front, it gets a new face yet remains immediately recognisable as an Optima. 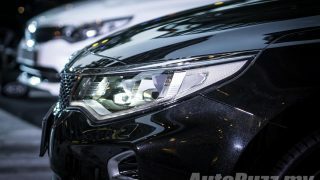 It gets sleeker full LED headlamps with Dynamic Bending Light (DBL) and LED daytime running lights, sporty front bumper with lower intakes and side air curtains. 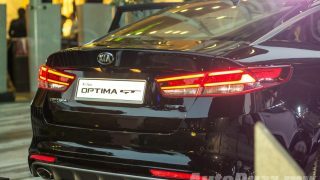 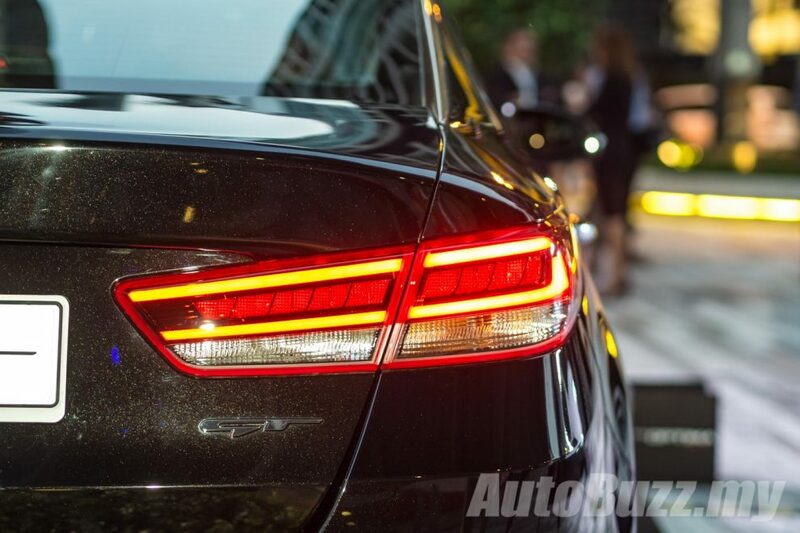 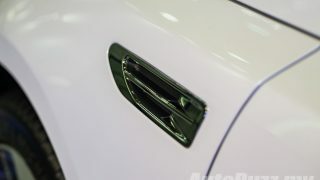 At the rear, it gets the exclusive LED combination tail lamps, rear diffuser with chrome garnish and dual exhaust tips. 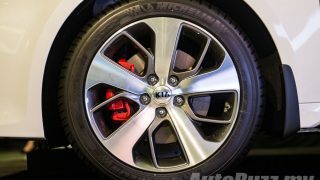 A gloss black roof, red brake callipers and 18-inch dual-tone GT alloy wheels wrapped in 235/45 profile Michelin Pilot Sport 3 tyres complete the exterior look of the car. 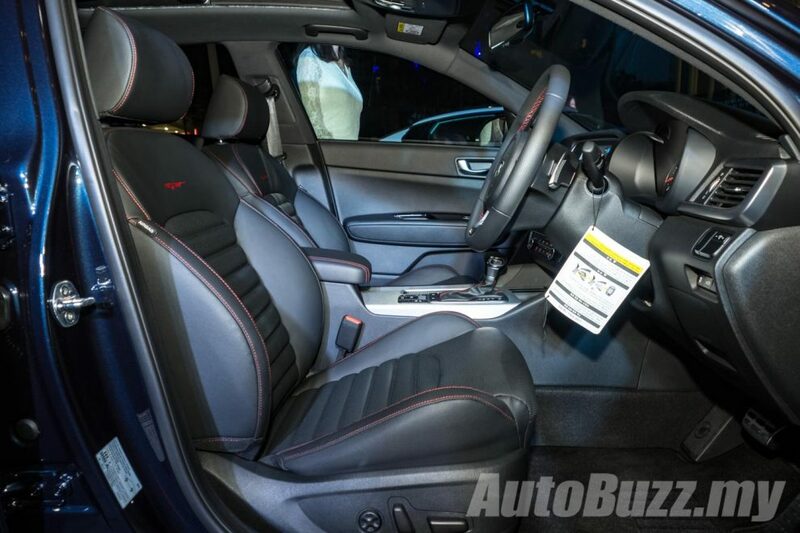 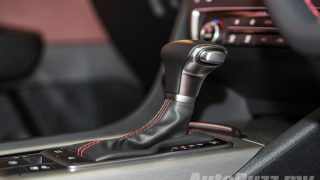 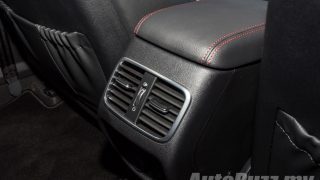 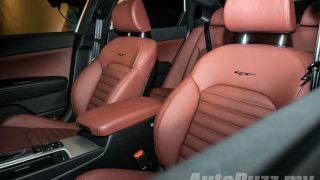 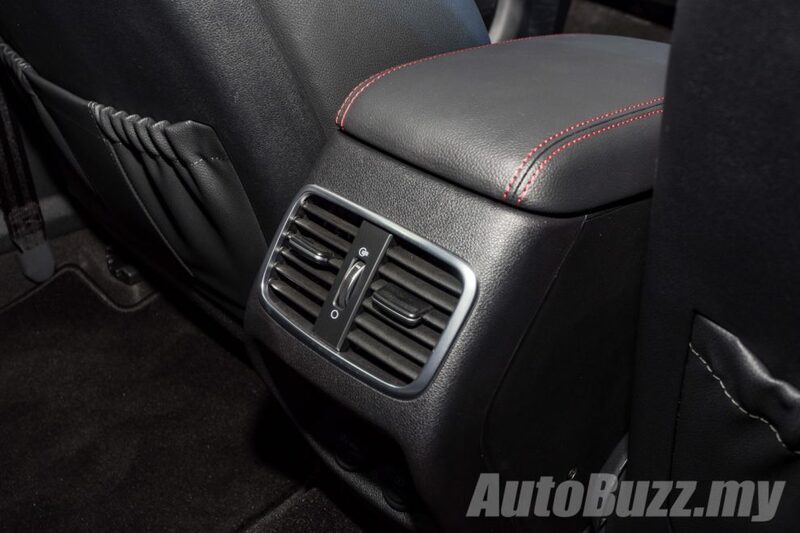 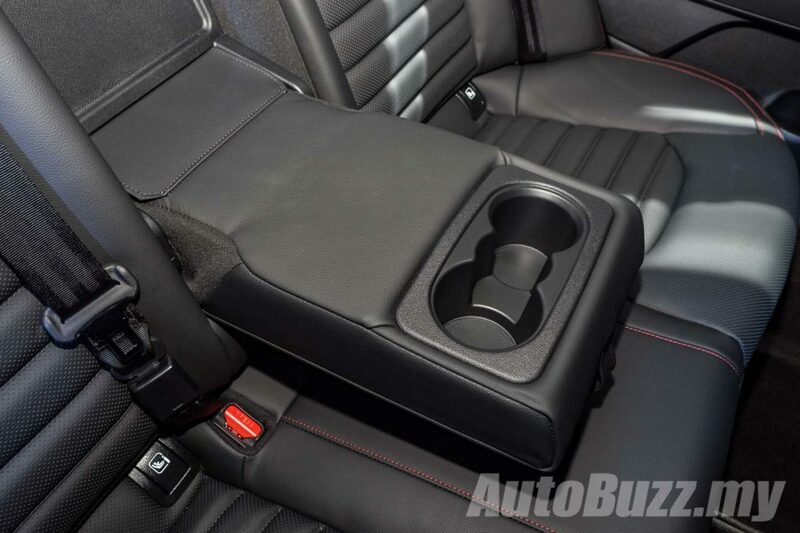 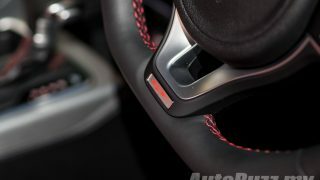 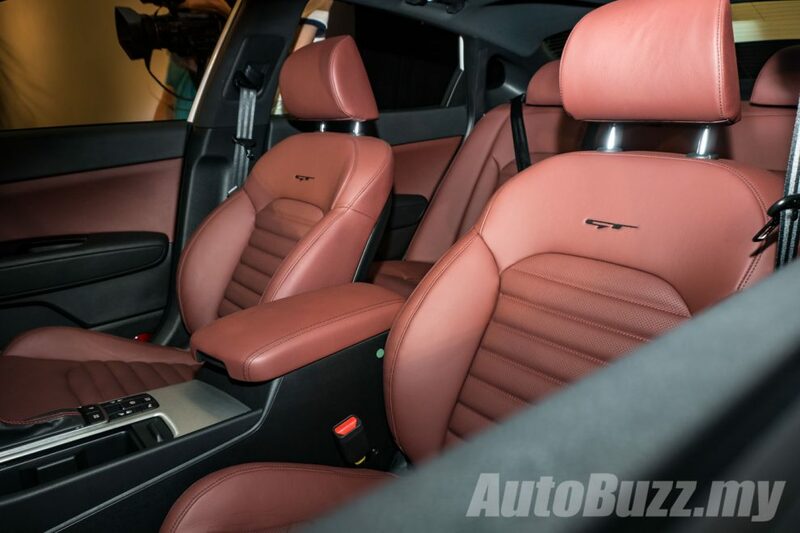 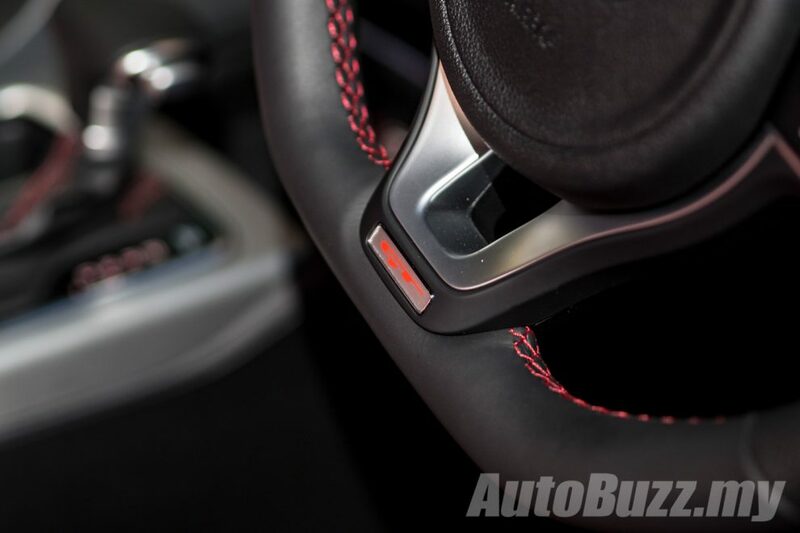 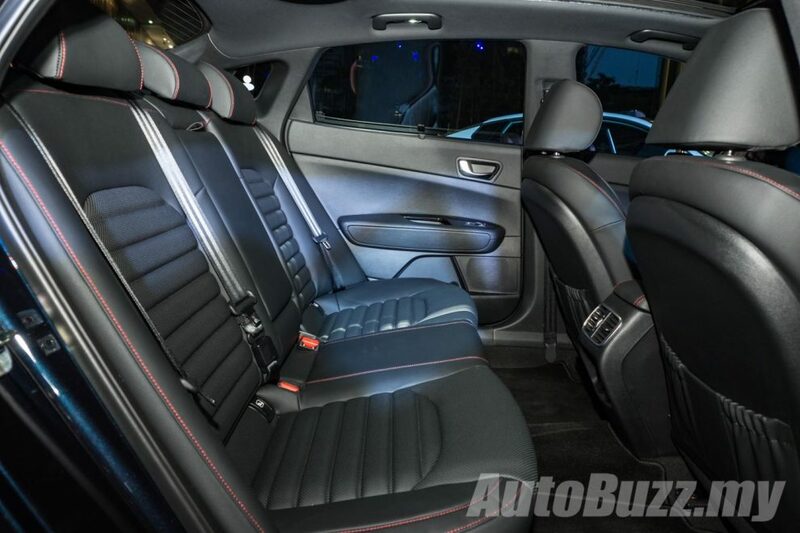 Customer can choose between two interior themes – red with grey stitching and black with red contrast stitching. 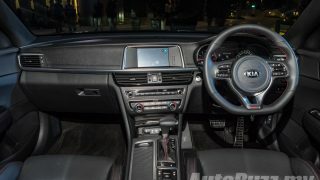 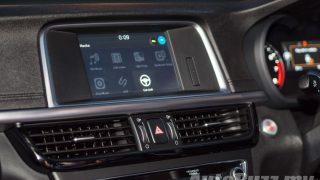 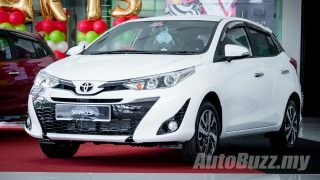 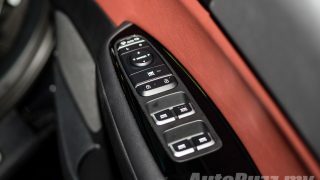 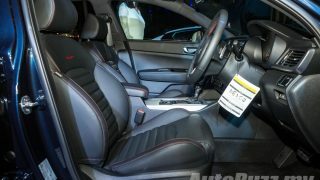 Regardless of colour choice, you get leather upholstery, 12-way powered driver’s seat with memory function, 10-way powered front passenger seat, electronic parking brake, 7-inch LCD infotainment system with 6-speakers, panoramic sliding sunroof, wireless charging tray, reverse camera, keyless entry and start, smart tailgate, 4.3-inch TFT instrument cluster display and rear air vents. 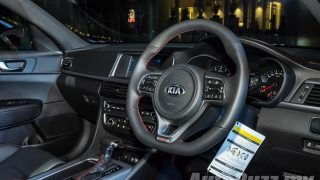 Some key features unique to this higher-performance variant include a flat-bottomed three-spoke multifunctional steering wheel with paddle shifters, Turbo-Torque display screen, GT seat embroidery and drive mode selector switch. 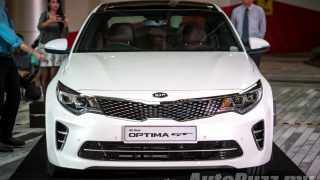 Motivating this D-segment sedan is a 2.0-litre turbocharged four-cylinder T-GDI petrol engine that develops 242 hp and 350 Nm of torque. 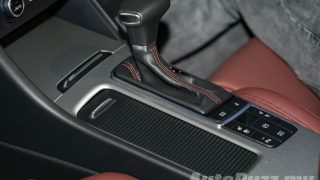 Drive is sent to the front wheels via a six-speed conventional torque converter. 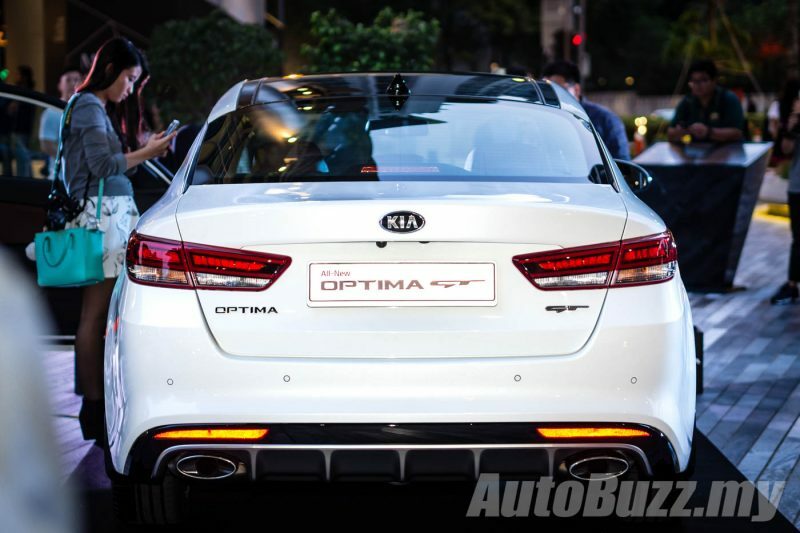 Sprinting to 100 km/h takes only 7.4 seconds, making it 3.6 seconds quicker than the outgoing 2.0-litre naturally aspirated Optima. It also gets a sportier GT Sports suspension setup – MacPherson struts up front and multi-link on the rear axle – to complement the dynamic engine performance. 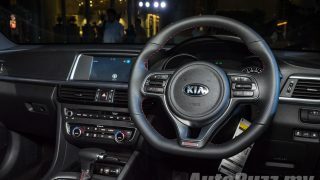 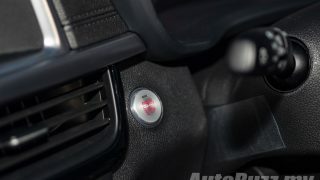 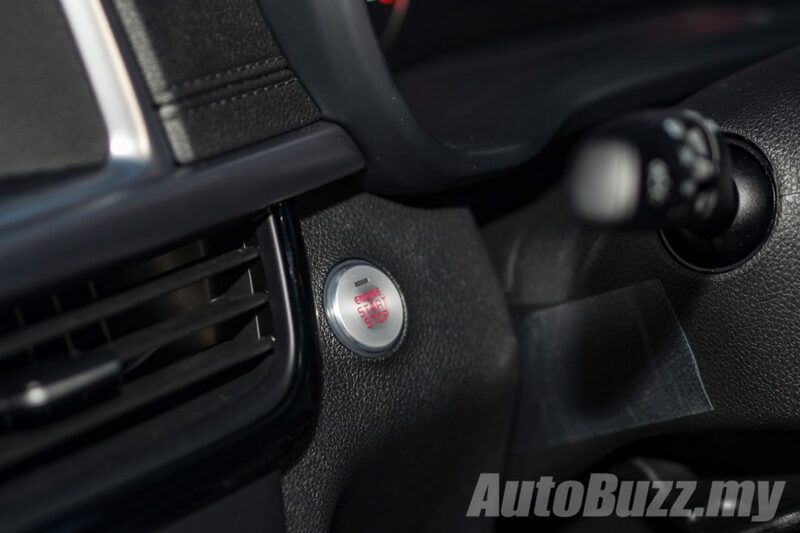 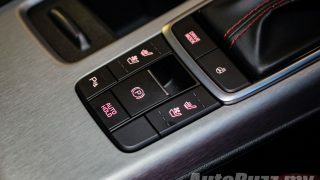 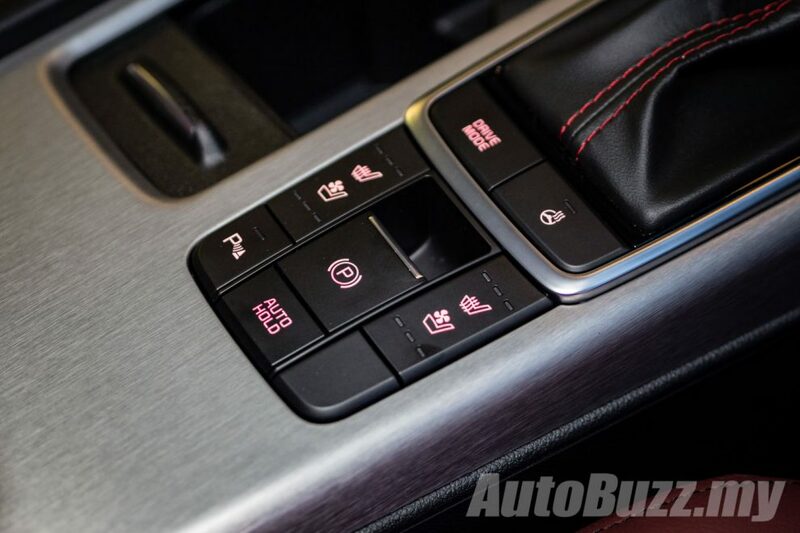 Drivers can select from three different drive modes – Eco, Normal and Sport, each altering the throttle response and steering weight accordingly. 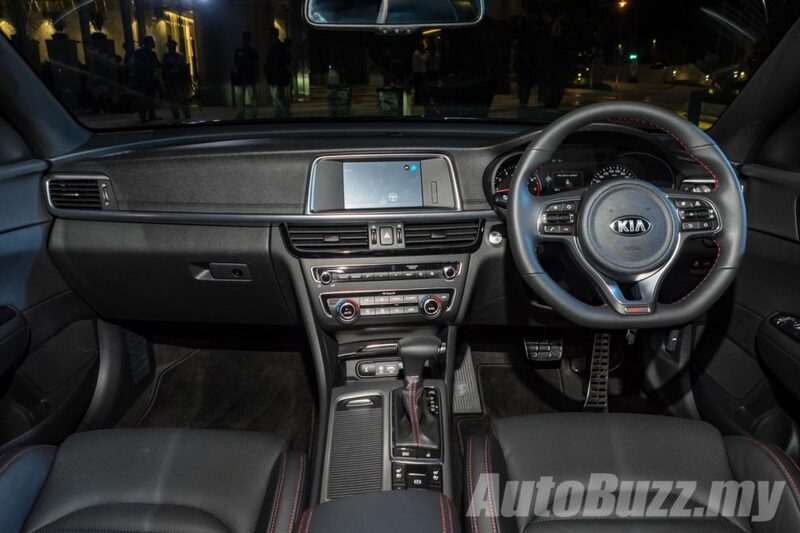 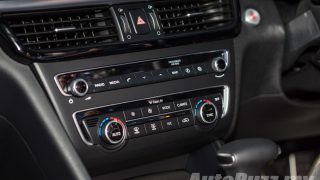 As standard, the Optima GT comes equipped with six airbags, ABS, Electronic Stability Control (ESC), Vehicle Stability Control (VSC), Hill-Start Assist Control (HAC), Emergency Stop Signal, Tyre Pressure Monitoring System (TPMS) front and rear parking sensors and ISOFIX mounting points. 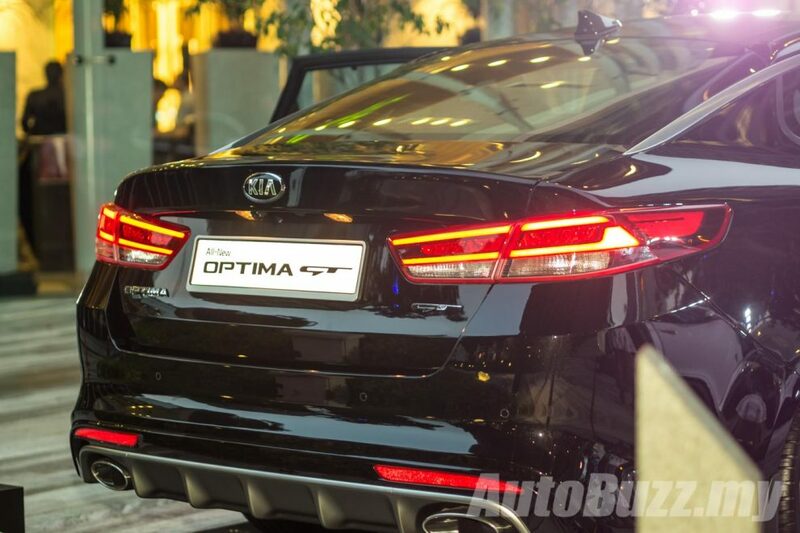 The Optima GT scored a full 5-Star crash safety rating at the ASEAN NCAP and EURO NCAP. 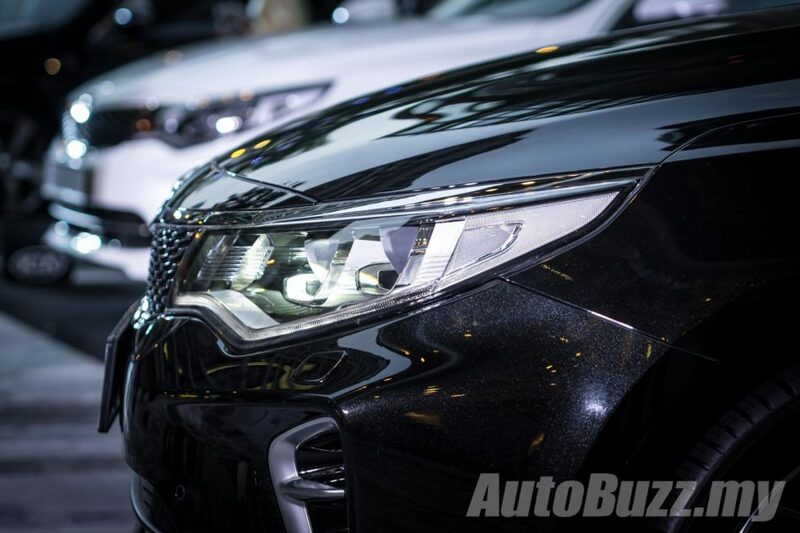 There are three colours on offer – Gravity Blue, Aurora Black and Snow White Pearl. 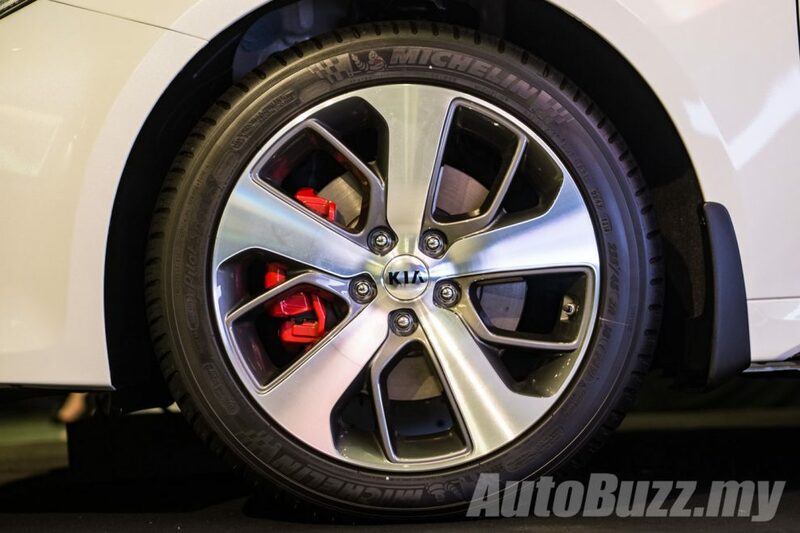 As with all new Kia models, the all-new Kia Optima GT comes with 5-years warranty package.